We’d love your help. Let us know what’s wrong with this preview of Little Big Love by Katy Regan. To ask other readers questions about Little Big Love, please sign up. I could ask my mom, I suppose, but detectives didn't work like that. Ten-year-old Zac knows he has a dad - everyone has to have a dad - but he's never met him. His nan lashes out with fury and his grandad gets real quiet every time Zac tries to talk about his dad. Most importantly, his mom (Juliet) never speaks of his dad (Liam) other than to say Liam "did a runner" before Zac was even born. "I only ever loved Liam. I don't think I even want a boyfriend if it's not him." My heart was going boom. I didn't dare speak in case she stopped talking. "I loved him and he loved me - so much. He did, I know he did. And I just can't imagine finding that again." Juliet is in a rut - has been in a rut - ever since that gut-wrenchingly awful day her brother (Jamie) died when Zac was just three weeks old. It was an accident - an accident that could have been prevented - but an accident nonetheless. Ever since that accident, Juliet (who's always been a bit hefty) has thrown herself into being the best mom for Zac. She's done her absolute best raising her son on her own - sure she indulges him here and there but honestly, he deserves a bit of sweetness in his life. And it hits me, then, that feeling I had when Laura was talking, the feeling like the incoming tornado. He's the Fat Kid. My son, he's the Fat Kid. Juliet, her mother and her father have each held onto a soul-crushing secret. None of their secrets are the same and the reveal of any one of these secrets could send their whole house of cards tumbling down on Zac's head. From start to finish, I loved the characters - the way Regan told wielded the three narratives (Zac, Juliet and Mitch (Zac's grandfather)) so expertly really made this story memorable. "Basically, I just think adults give in," she said, putting her hair behind her ears, "They give up too soon because they just don't have the energy. It's why they need us"
And I really connected with Juliet- I felt like I could sit down with her and have a cup of tea like old friends. Her insecurities, such as those concerning her son, her weight and her loneliness, made her feel far more than a character in a book - she felt real. This novel had just the right doses of heartwarming and heartbreaking - if you are looking for a wonderful beach read or a book that will leave you with a smile on your face, make sure to pick this one up! Little Big Love is about a 10-year-old boy’s mission to meet his father. Centered around unconditional love, family, friendship and long-buried secrets, this is enjoyable and emotional read that made me laugh and cry! The narrative is told from the POV’s of 10-year-old Zac, his mother, Juliet, and his grandfather, Mick. 10-year-old Zac has never met his father. All that he knows is that his father “did a runner” before he was born. One night his mother comes home Super sweet and Heartwarming! 10-year-old Zac has never met his father. All that he knows is that his father “did a runner” before he was born. One night his mother comes home after a bad date and spills that she still loves Zac’s father. Zac then gets the idea in his head to find his father and reunite him with his mother at his 11th birthday party. He recruits his best-friend Teagan for his “super-secret” mission. Juliet and Mick, Zac’s mother and grandfather, have kept a lot of secrets related to Zac’s father. As a result, they are both suffering in silence. What they don’t fully understand is how these secrets are affecting Zac. I really enjoyed reading this. It’s fast-paced and not overly bogged down in drama. While there are some dark moments and family drama, there’s a lot of humor mixed in to lighten things up. Zac’s character is what I love most about this book. He’s such a sweet little boy who doesn’t have a mean bone in his body. He is bullied non-stop, which is hard to read. On the upside, he does have a lovely friendship with Teagan. His character stole my heart! I loved the final chapters so much that I reread them! I will definitely be reading more from Katy Regan in the future. I highly recommend for a feel-good read! I’ve been reading so many heavy books lately, and I readily admit these are the types of stories I am drawn to. Once in a while I need a break and I read that this was a feel good story. However, I soon found that it was not a light read. There’s bullying, alcoholism, grief that causes some of the characters to make mistakes that will make them carry remorse and secrets for years. Child narrators appeal to me, mostly for their capacity to many times see things as they are and tell it like it is. So of course, I especially liked ten year old Zac’s narrative as he struggles with bullying over his weight and wants so much to find the father he never knew. There are two other narratives - his mother Juliet , struggling to be a single parent and dealing with her own issues of low self esteem, and his grandfather Mick who deeply loves his grandson and keeps a secret for fear of losing him. I connected with Zac and Mick from the start, but it took me a while to warm up to Juliet. The beginning and ending were much stronger than the middle of the book, which felt slow at times, thus the 3.5. I was, however so vested in Zac’s search for his father and the last part of the book was particularly well done so I rounded up to 4 stars. Recommended to those who love a good family story about some realistic issues. This book surprised me... I was expecting a light fun adorable read and what I got was so much more! This was a book about family, secrets, forgiveness, and love.... this was absolutely a more emotional read than I was anticipating, but so worth it! Zac was an enchanting 10-year-old boy with a heart of gold... loved his obsession with fax and his friendship with the equally delightful Teagan... I felt so much for him especially when he was bullied for his weight... and my heart broke for his desire to find his father... but truly my absolute favorite part of this book was the charming friendship between Zac and Teagan... everybody needs a Teagan in their lives, she was just an exceptional character.... and some of her insights far surpassed her 10 years! The story is told from the POV of 10-year-old Zac, his mother Juliet, and his grandfather Mick. I enjoyed all three perspectives. Zac has never met his father, who “did a runner” before he was born. Zac decides he will undertake a super-secret 'Find Dad Mission', and he recruits his best friend Teagan to help him. The plan, of course, is not just to find his father, but to re-unite his parents. Zac...what a sweet boy with a big heart. Although Zac’s insights seemed particularly astute given his age, I fell in love with him and my heart broke over the bullying he endured over his weight. His hope and optimism were endearing. I loved how he collected facts, and they were quoted at the beginning of chapters. I really loved his best friend Teagan too....what a great friend she was. Mick, the grandfather, is holding onto an explosive secret that he'd rather not reveal. Juliet and Mick both love Zac deeply but each of them has kept secrets from each other and from Zac. Secrets that, if revealed, have the potential to cause a lot of damage. *Many thanks to Elisha at Berkley Publishing for a copy of this book for review. All opinions are my own. At school, things are even worse, his schoolmates tease and taunt him mercilessly, pick on him, which escalates as time goes by. His mother sees him as a normal healthy, growing boy, but he is teased about being overweight, and when his teacher contacts Juliet to talk about Zac’s weight, about him losing weight. What she considers baby fat, the school is considering obese. The more Zac is teased, the more unhappy he becomes, the more he turns to food – the one thing he knows that ties him to his father. He loves to cook. Eventually Juliet sees the need for change, and starts to encourage healthier eating, some changes in their lifestyle, reaching out to a former boyfriend for assistance in the exercise department. In order to motivate him, Juliet agrees to answer a question about his father after they’ve run a specified time. In the meantime, her head is spinning about what she will say. There are so many secrets that have yet to be revealed, so many things unsaid, and so many hurt feelings that will surface. Zac and his best friend Teagan join together on this mission to find Liam, a mission that is fraught with mishaps, but also brings them closer to the truth. And, as they draw closer to the truth, the adults are worried about how Zac will deal with the truths behind Liam’s leaving. They are also worried about how each of them will deal with revisiting that painful time. I loved Zac, loved his mission to track down his father and find out the truth about why he left. The chapters narrated by Zac were my favourite, although I also loved those by Mick, as well. Juliet was a little bit too scattered for me, and seemed to be wallowing in her misery a bit too much. Overall, this was an engaging and heartwarming story of a young boy’s unwavering search to find his father, secrets, absolution, family, friendship, and, most of all love. As endearing as it is entertaining. This is like a Nick Hornby novel (About a Boy, espesh) with much less "machismo" & an even higher tear-to-laugh ratio. I thoroughly enjoyed the Searching For Father story; even more, the finale which stays with you, especially if a child in your life is being bullied. Thank you, Berkley Books, for the advanced copy. I can’t quite bring myself to rate Little Big Love in a way that rounds up to 4 stars. I enjoyed parts of it but I found it took an awfully long time to get to what was a fairly predictable end. Zac is 10 years old and lives with his single mother Juliet. As far as Zac knows, his father did a runner before he was born, but he’s determined to find him. The story focuses on Zac’s quest to find his father and the backstory about why his father disappeared. The story is told from Zac, Juliet and Zac’s grandfather’s points of view. Zac is wise, overweight and plagued by bullies. The adults are flawed, but not ill meaning. They’ve made bad decisions they can’t seem to shake. What I liked about Little Big Love is the voice the author gave each character, especially Zac. The characters had some dimension and there is fair bit of humour, despite some sad parts. This is what kept me reading. But I did find it dragged on and was predictable, all topped with a very unlikely ending. Zac Hutchinson is a 10-year old boy growing up in a small town in England with single mom Juliet and his nearby grandparents, Lynda and Mick. He’s a lovely young boy who is fascinated with facts. After a particularly troublesome night where he hears his mother admit she still loves his father who disappeared when he was born, Zac embarks on a mission to find his “dad” with the help of his best friend Teagan. Unfortunately, he’s facing some serious challenges as his family is just as determined t Zac Hutchinson is a 10-year old boy growing up in a small town in England with single mom Juliet and his nearby grandparents, Lynda and Mick. He’s a lovely young boy who is fascinated with facts. After a particularly troublesome night where he hears his mother admit she still loves his father who disappeared when he was born, Zac embarks on a mission to find his “dad” with the help of his best friend Teagan. Unfortunately, he’s facing some serious challenges as his family is just as determined to keep secret the reasons behind his disappearance. First of all, Zac is just a lovely, wonderful little boy. He has a big heart and is kind to a fault. He’s the center of mom Juliet’s world but not always in a good way, especially when it comes to their eating habits. The story is told from Zac, Juliet and Mick’s perspectives, which often sheds much needed light on the others’ points of view. The quest to find Liam Jones, Zac’s father, unraveled so many issues within each of them and the family, making this a layered and emotional journey. This family broke almost eleven years ago and never really recovered. Zac is the key to them finding their way to recovery, no matter how painful. This book was a slow burn for me. I struggled through the first half, taking days to get there. But something miraculous happened at the halfway point. It all began to gel and I literally could not let the story go and finished it in one day. You absolutely must push through the initial malaise because the payoff is extraordinary. The scene in the restaurant? I’ll never, ever get over that. Cried like a baby. This story will stick with me forever. It’s not all sweetness and light but what is makes it a must read. A charming and emotional story about love and family. The story is complex, much more so than it seems from the blurb. This isn't simply a story about a little boy trying to reunite with his father, it's so much more. It deals with secrets, forgiveness, and a lot of issues people face in their every day lives. Main character Zac is bullied fairly mercilessly at school, and it's hard to stomach sometimes... especially because he is just the sweetest thing. We also get perspectives from his mother A charming and emotional story about love and family. The story is complex, much more so than it seems from the blurb. This isn't simply a story about a little boy trying to reunite with his father, it's so much more. It deals with secrets, forgiveness, and a lot of issues people face in their every day lives. Main character Zac is bullied fairly mercilessly at school, and it's hard to stomach sometimes... especially because he is just the sweetest thing. We also get perspectives from his mother, and some from his grandfather. I enjoyed getting everyone's version of the story. It made their motivations easy to understand. Though I haven't been through what any of them have really, they were still easy to relate to because of that. This is a lovely and sweet read with a lot of humor mixed in, and I'm so glad I got the opportunity to review it. There aren't a lot of surprises here, but there doesn't need to be. Ten year old Zac and his best friend Teagan like to play a little game: assigning different men they know a certain amount of points, deciding who would make the best possible father. Teagan's father left fairly recently and doesn't seem to want anything to do with her anymore, but Zac has never known his own father. He has no memories of the man, but he wishes he'd return just as strongly as Teagan wishes her own father would come back. Their sweet desperation leaps off the page, and it's more than a little heartbreaking. When Zac's mom Juliet has a rare evening out and has too much too drink, she actually talks to Zac about his father, confessing drunkenly that she still loves him. If there's one thing Zac wants just as much as seeing his father, it's his mother's happiness. This is all the motivation he needs to embark on a crazy journey to find his dad. Unfortunately, he knows very little about the man... and absolutely nothing about why he left, and it's more complicated than he could ever imagine. Juliet loves her son Zac. She wants, as all moms do, the very best for her child. However, unfortunately, Zac who has a super big heart, is going through some tough times. He is overweight making him the target for bullies, but he and his best friend, Teagan, set out on a mission. That mission is to find and reunite his dad to his mom. Juliet struggles with single parenthood. She does have parents who support her and love Zac but something awful happened years ago and set them all at odds with one another and has separated both Zac and his mom from their father and the man Juliet still loves. Mick, Zac's grandfather tells his own story, but he holds a terrible secret within him and at the end of this tale, the truth, as it always does comes out. This was a sweet family drama with lovable characters that feel strong love for one another. Zac does not give up no matter what obstacles are in his path and this cute story ends on a very positive note. This was a lovely summer read, one that we often need when reading some of the hard topics that one finds in many of the books we read. Save a little spot in your heart for this book. “Being deeply loved by someone gives you strength, while loving someone deeply gives you courage.” (Lao Tzu)...and Zac has sure has tons of that! I read this book with the Traveling Sisters group and as always thank them for taking this book journey with me. Set in the "fishing capital of Europe," Grimsby, Lincolnshire, England, Little Big Love is the story of Zac, a ten-year-old boy with so much love and longing in his heart that he won't give up his mission to find his dad, no matter what the odds. For Zac has always been told that his dad did a runner before he was born, that the man was just a waste of space. But at 10, Zac now has questions: Why did dad leave? Doesn't he love me? Doesn't he care enough to get to know me? 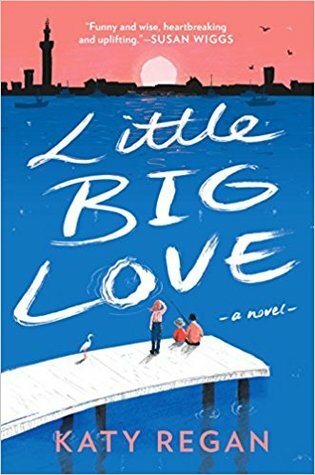 This is a story of deepl Set in the "fishing capital of Europe," Grimsby, Lincolnshire, England, Little Big Love is the story of Zac, a ten-year-old boy with so much love and longing in his heart that he won't give up his mission to find his dad, no matter what the odds. For Zac has always been told that his dad did a runner before he was born, that the man was just a waste of space. But at 10, Zac now has questions: Why did dad leave? Doesn't he love me? Doesn't he care enough to get to know me? This is a story of deeply-hidden family secrets and the stories made up to cover them. For the past ten years, since the accidental death of Zac's Uncle Jamie, nothing has been the same for his maternal family. They are each still dealing with rage, grief, guilt and longing. Can Zac ferret out the truth buried beneath all these emotions? The story is told from three points of view: that of Zac, his mother Juliet, and her father, Mick. Katy Regan does a superb job with those three different voices, which isn't always easy for a writer. These characters are so well done and believable. I just loved Zac and his best friend, Teagan, who is his partner on his Find Dad mission! Although the tone is warm-hearted and even laugh-out-funny at times, Ms Regan delves into some hard topics, such as childhood obesity, bullying, single-parenting, alcoholism, shoplifting, poor living conditions and life-threatening childhood illness. I found this story so utterly charming. It brought back to me what it was like to be ten, thinking I knew so much but being unable to fathom adults and their actions. And Zac's deep down longing for the things it seems he can never have--I remember that especially. And just when the reader thinks all the secrets have been revealed, there's another shocking admission from an unexpected source! Love being surprised in that way, hearing pieces fall into place! Aha! Zac Hutchinson is a ten-year-old boy living with his single mother, Juliet, in England. He doesn't remember his father since he left the family when he was a baby. He starts to question his roots and finds his family is evasive with their answers. The details surrounding his father's disappearance has been secreted by his mother and grandparents for a decade. As the facts unwind he learns that his mom still carries feelings for his father and makes it his goal to locate him. Juliet is a hard work Zac Hutchinson is a ten-year-old boy living with his single mother, Juliet, in England. He doesn't remember his father since he left the family when he was a baby. He starts to question his roots and finds his family is evasive with their answers. The details surrounding his father's disappearance has been secreted by his mother and grandparents for a decade. As the facts unwind he learns that his mom still carries feelings for his father and makes it his goal to locate him. Juliet is a hard working mom who struggles as a single parent. She lacks time to work full time and to effectively care for her curious son. Zac is overweight and lacking a male role model and which makes him a target for bullies. When she discovers Zac’s mission to find his father, she decides it's time to help him on his quest. 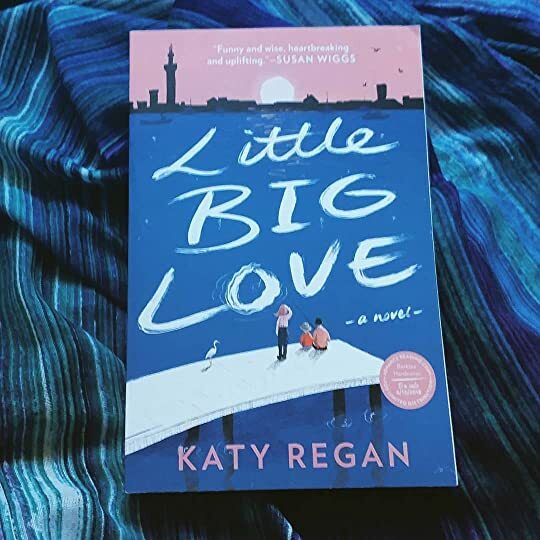 Little Big Love is the US debut for UK author Katy Regan. The book is told in three voices providing an interesting perspective as it crosses multiple generations. This is a perfectly titled book which examines the depth of love and families. I do have mixed feelings about the story. The premise of the story is amazing. I’m sure so many children feel the same way as this young boy. Launching a campaign to find his dad is exactly something children of that age will do. I know I would. But what I didn’t agree with, nor did I care for, was how the adults handled the entire situation. Without giving any spoilers, let’s just say that I understand hurt feelings and not seeing both sides of the story can do Sweet and sad.. But what I didn’t agree with, nor did I care for, was how the adults handled the entire situation. Without giving any spoilers, let’s just say that I understand hurt feelings and not seeing both sides of the story can do incredibly terrible things to someone. But being selfish comes at a big price for others. The author did a wonderful job with her realistic down to earth writing and gave this book levity and humor, some anger and disappointment, frustration, and yet hope for the future. We got the entire range of emotion from a child’s point of view and the adult point of view. While I had mixed feelings as I was reading this since it is both sweet and sad, understand that the story leaves you with a beautiful happy heart and sometimes that is amazing all on its own. Love is blind. Love is patient. Love is kind. Love is forgiving. Sure is and oh by the way ten year old Zac is going to steal your heart in this one. Trust me! Zac Hutchinson is a young detective (in his own right) and has an accomplice Teagan to help in solving the mystery of his DAD Liam . Of course he has a colorful M.O. (modus operandi) or a way of doing things to get the job done. Using plenty of good ol fashioned grease work he uncovers the truth and unravels the mystery piece by piece start Love is blind. Love is patient. Love is kind. Love is forgiving. Using plenty of good ol fashioned grease work he uncovers the truth and unravels the mystery piece by piece starting with his Uncle and the connection between him and his father. As he starts to break down the lies by weaving through the family members he becomes clearer as to not only his mission but his goals. As his plan is laid out he gets some new helpers one of which is his mother. You see, his mom never gave up the idea of loving Liam. In fact he was her one true love. Perhaps their may be a rekindling love in this novel? However, don't jump ahead because this book will provoke some strong emotions on both sides especially in the eyes of Zac, Juliet (mom) and Zac's grandfather Mick. Little Big Love has multi layers that are equally revealing like the skins of an onion that'll make you tear up. A beautiful heartfelt thing of beauty! Make sure you read this one! Zac is a ten year old who is on a mission to find his father but nothing is as it seems. There were so many lies that had been uncovered and it really blew me away while reading. This was my first time reading this author and I enjoyed this book very much! It was written in three points of view and you could tell who was who which I sometimes have an issue while reading. So the fact that all the characters didn’t sound the same was a plus in my book. I would have liked a point of view from Liam’ Zac is a ten year old who is on a mission to find his father but nothing is as it seems. There were so many lies that had been uncovered and it really blew me away while reading. This was my first time reading this author and I enjoyed this book very much! It was written in three points of view and you could tell who was who which I sometimes have an issue while reading. So the fact that all the characters didn’t sound the same was a plus in my book. I would have liked a point of view from Liam’s perspective. He went ten years years with no contact when it came to his son and I would have liked to be inside his head during this time. The author also touched on addictions and how they can interfere with your families dynamic. As a daughter of an alcoholic this story touched close to home. It also mentioned other addictions and issues as well that people don’t seriously and I could once again relate on so many level. In closing this was a very well written heartwarming and heartfelt story about love and forgiveness. I will definitely be checking out more books from this author and one of my favorite reads of 2018! This was not exactly what I had expected, but it was an interesting read anyways! Little Big Love is written in three changing perspectives - Zac, a young boy who is overweight and searching for his father; Juliet, Zac's mother; and Mick, Zac's grandfather who is hiding a few secrets of his own. That one night, years ago, everything changed, and the family only agrees on one thing: Don't tell Zac. But as he grows up, he becomes determined to discover the other half of his family. There were definitely a lot of things going on in this book, and while I understand that realistically a family could deal with multiple issues at once, I feel like it made the book a little messy because there seemed to be multiple plots going on at once. The book covered alcohol addiction, bullying, obesity, binge-eating, grief, and of course, family; the two big ones were Zac being bullied for being overweight, and him finding out the truth about his father. I feel as though one of these plots should have been treated with more significance with the other, but because they were both often mentioned and were never really intertwined, I felt almost as if I was reading two different stories. The characters were okay; Zac's narration is definitely in the tone of a child, and it almost made me wonder if this book would be more suited towards a middle-grade reader. I did like the more adult tone of Juliet and Mick's perspectives, but their voices weren't nearly as interesting as Zac's. The author definitely succeeded in making the styles align with the intended narrator. I didn't really love the characters too much, and while I understand that everyone was dealing with different issues, and that grief is such a powerful emotion, I didn't feel as connected to them as I could have. Instead, I was frustrated and sometimes, downright annoyed with just how extremely self-centered many of the characters could be. Zac and his bestfriend like to discuss who is an ideal father candidate around their little community on the English Coast. Zac's dad, Liam pulled "a runner" before his birth according to Juliet, his mother, because in her opinion the truth is just to painful to explain to a little boy. When she is contacted by his school about being bullied for being obese, she is not sure how to motivate him to exercise and seek healthier eating options and greater self-control. Eventually, Juliet realizes and Zac and his bestfriend like to discuss who is an ideal father candidate around their little community on the English Coast. Zac's dad, Liam pulled "a runner" before his birth according to Juliet, his mother, because in her opinion the truth is just to painful to explain to a little boy. When she is contacted by his school about being bullied for being obese, she is not sure how to motivate him to exercise and seek healthier eating options and greater self-control. Eventually, Juliet realizes and accepts that she must also confront her own eating disorder and her low self-esteem to be a role model to Zac. One day, Juliet is observed by Zac returning from a date and she does something truly unflattering (I won't tell you cuz it's funny). She having had to much to drink confides in Zac that Liam was her only true love. Zac is determined to locate and confront Liam for pulling a runner. He hopes that his dad will in turn love both Zac and his mum, Juliet. Unfortunately, little information can be found by Zac based on what clues he has been given but soon his detective skills provide him with some good leads. What he doesn't know is that a secret kept by his mother and grandparents is poisoning each one differently and each one has a reason for Zac not knowing the whole truth. As Zac gets closer to finding Liam, the family implodes by arguing their points and Zac realizes that he is the cause but is not sure why. Furthermore, family members aren't being completely honest with each other. As secrets are brought forth, healing begins. I love this story - it was both heartwarming and heartbreaking at the same time and a unique view of a family who is stuck from moving on from a terrible loss 10 years earlier. I did feel it was a bit long and parts could have been edited down, hence the 4 over 5! Ten-year-old Zac is about to launch his “Find Dad Mission.” Although they’ve never met, Zac just knows his Dad will want to meet him; and come to his 11th birthday party in May. That’s the plan anyway. He’s had very few clues about his Dad from his Mom, Juliet and his Grandpa and Nan (Mick & Lynda). He knows his Uncle Jamie died very soon after he was born, and at young age. His Dad, Liam left them right after that. After ten years his Mom still cries about it and his Grandparents don’t seem Ten-year-old Zac is about to launch his “Find Dad Mission.” Although they’ve never met, Zac just knows his Dad will want to meet him; and come to his 11th birthday party in May. That’s the plan anyway. He’s had very few clues about his Dad from his Mom, Juliet and his Grandpa and Nan (Mick & Lynda). He knows his Uncle Jamie died very soon after he was born, and at young age. His Dad, Liam left them right after that. After ten years his Mom still cries about it and his Grandparents don’t seem to like Liam very much. Zac is so confused, but no one will tell him anything. Luckily his best friend, Teagan who lives near him, makes him laugh so he feels less anxious being around her. Katy Regan, a popular UK author, has written a captivating family drama with US debut novel, "Little Big Love." Told from three POVs: Zac, Juliet and Mick. Zac is curious and intelligent and forever asking questions; trying to piece together the mystery of his father leaving them. Juliet’s dialogue is witty and sad simultaneously, as she can’t figure out the reason as well. She’s totally loves her “perfect son” but still pines for Liam, the love of her life. She does know that he left the same night her 18-yr. old brother Jamie, drunkenly fell or jumped off a bridge but doesn’t know if Liam had anything to do with it. Her parents, Mick and Nan are good people and help her with Zac, but they won’t talk about the incident with Jamie because it’s so painful. Mick was a rough, seafaring fisherman for 25 years, but now in his 60’s, sober and content to be with family and his beloved grandson. As Zac continues his quest with Teagan’s help, the eventual climax of his mission will bring truth, pain and joy. It’s a long road ahead, but it’s worth the trip especially if you have Zac by your side. Please read this family story, for everyone grows a little, with love. A captivating family drama with the most appealing characters that draw you fully into the touching story. Young Zac has reached a point in his life where he wants to know more about the dad who abandoned him as a baby. He has always been told by his mother Juliet that Liam, his father, just took off, never to be heard from again. His grandparents have always reinforced the message, his Nan reserving a special kind of scorn anytime Liam's name is mentioned. Zac refuses to believe that his dad wou A captivating family drama with the most appealing characters that draw you fully into the touching story. Young Zac has reached a point in his life where he wants to know more about the dad who abandoned him as a baby. He has always been told by his mother Juliet that Liam, his father, just took off, never to be heard from again. His grandparents have always reinforced the message, his Nan reserving a special kind of scorn anytime Liam's name is mentioned. Zac refuses to believe that his dad wouldn't want to know him if he actually met him, and along with his best friend Teagan, embarks on a mission to track him down. What Zac doesn't know though, is the real reason for Liam's disappearance. As his quest gathers pace, details of the days after Zac's birth begin surfacing, and truths are revealed that could split the family further apart, or bring them together. The characters are the strong point in this book, they were superbly drawn and felt so convincing. I especially loved 10 year old Zac and his loyal friend Teagan, but Juliet, struggling to cope as a single mother was excellently portrayed. The story manages to be moving, heart-warming, sad and even humorous at times, and I couldn't recommend it highly enough if you enjoy family based books. A big 5 stars! Katy Regan, Author of "Little Big Love" has written a charming, delightful, heartwarming novel. The Genres for this novel are Fiction, and Women's Fiction. The author describes the characters complicated and mostly likable. The story is told through the eyes of ten year old Zac, Juliet and Mick, the grandfather. This is a novel about family, betrayal, love, forgiveness and hope. Zac was too young to be aware of what happened ten years earlier, but is obsessed and fixated on the fact that he wants to know about his biological father. There are deep secrets if revealed can provide the information, but can destroy the family. I really enjoyed Little Big Lies, I would give it 4.5 stars. There wasn’t one character that I didn’t like or love. Katy Regan told the story from three alternating perspectives, Zac, the 10 year old son, Juliet, the mother of Zac, and Zac’s grandfather, Mick. Zac is determined to find his father who ran off when he was three weeks old and invite him to his 11th birthday party. This was such a well written novel. Regan did a superb job at making each voice sound unique. Zac felt like a REALLY swe I really enjoyed Little Big Lies, I would give it 4.5 stars. There wasn’t one character that I didn’t like or love. Katy Regan told the story from three alternating perspectives, Zac, the 10 year old son, Juliet, the mother of Zac, and Zac’s grandfather, Mick. Zac is determined to find his father who ran off when he was three weeks old and invite him to his 11th birthday party. This was such a well written novel. Regan did a superb job at making each voice sound unique. Zac felt like a REALLY sweet 10 year old boy who I loved, I just wanted to protect him and give him and his best friend Teagan great big hugs. I just wish the final chapter had let us know how Mick was doing. Dit boek is prachtig, maar aan de andere kant ergerde ik me er ook aan. De eerste helft is namelijk super traag. Het duurde dan ook 2 maanden voordat ik dit boek uit had gelezen. Maar nu? Dit boek heeft een speciaal plekje in mijn hart en dat komt vooral door Zac. Zac is zo'n lieverd! Alleen al voor hem zou je dit boek moeten lezen. A big story — simultaneously heartbreaking and heartwarming — about a family that fell apart after a tragedy that occurred ten years in the past and the young boy who now desperately wants to know his missing father. Part coming-of-age for 10-year old Zac and part coming-to-terms-with-the-past f Thank you to Berkley Publishing Group and NetGalley for an early review copy of Little Big Love by Katy Regan, which will publish June 12, 2018. All thoughts are my own. I loved seeing the world through Zak’s eyes. What an insightful and loving little man! This book was a book about so many life issues (family secrets, alcoholism, binge eating, single parenting, bullying, mental illness, grief) but is told in a way that you are learning without being “preached at”. I only hope I can be as positive and ambitious as Zak! Little Big Love is a beautiful book that had me laughing and crying throughout because it is just such a heartfelt, endearing, and captivating family drama. Ten-year-old Zac just stole my heart in his quest to find his dad, Liam, who he knows absolutely nothing about except that no one in his family really talks about him (and if they do, his grandma gets very upset), and his mom told him that his dad ran away before he was ever born. Yet, one night after a date that went very wrong, his mom Jul Little Big Love is a beautiful book that had me laughing and crying throughout because it is just such a heartfelt, endearing, and captivating family drama. Ten-year-old Zac just stole my heart in his quest to find his dad, Liam, who he knows absolutely nothing about except that no one in his family really talks about him (and if they do, his grandma gets very upset), and his mom told him that his dad ran away before he was ever born. Yet, one night after a date that went very wrong, his mom Juliet breaks down in tears and admits she still loves his dad, the "love of her life," after all these years, which only makes Zac want to find his dad more since he not only wants a dad in his life but wants his mom to be happy. The story is told in three alternating POVs by Zac, his mom Juliet, and his granddad Mick. Zac's voice is the most endearing. He is intelligent and curious as he puts together the pieces of the past to figure out what happened between his mom and dad along with the help of his quirky, bright best friend Teagan. Juliet has been hiding the pain of the loss of Liam and the death of her brother Jamie, which occurred at the same time, behind constant overeating, and you can really feel her struggle as a single mother trying to do her best while dealing with loss and grief. These are fantastically portrayed characters who just felt so real and I enjoyed them so much. I enjoyed this novel tremendously, especially the ending! I most definitely recommend Little Big Love if you love reading family dramas that will warm your heart! Well deserving of 4.5 Stars! !